Sorry... the 2016 Chevrolet Malibu Limited is no longer being sold as new. Chevrolet introduces a new model for 2016, the Malibu Limited, which really doesn’t have anything new about it. Big changes are on deck for the 2016 Malibu sedan but with the outgoing model still around, Chevrolet has renamed it the Malibu Limited and they will continue to sell it into the new model year. Simple translation: 2016 Malibu Limited = 2015 Malibu. The most prominent styling feature is a “dual-port” front grille that has chrome accents and a large bowtie logo mounted on the body-colored trim piece that splits the grille in two. 16-inch alloy wheels come standard, with larger wheels up to 19-inches in size optional. The Malibu Limited will be offered in LS, LT, and LTZ trim levels. Under the hood, the Malibu Limited offers a pair of four-cylinder engines, one tailored towards efficiency and the other for performance. The base engine is a 196-hp, 2.5-liter four-cylinder, while those looking for more performance can opt for a 259-hp, turbocharged 2.0-liter four-cylinder. Both engines come mated to a six-speed automatic transmission and front-wheel drive. Fuel economy ratings are average for this segment, 25/36 mpg city/highway for the base engine and 21/30 mpg for the turbocharged engine. Moving inside, the Malibu Limited offers a standard 60/40-split folding rear seat with 16.3 cubic feet of cargo room behind it. Standard features include air conditioning, cruise control, power windows/locks, and remote keyless entry. 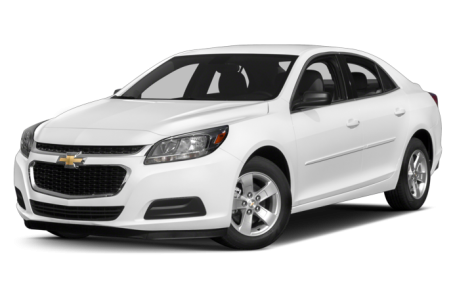 The Malibu also offers a large list of available tech options, including Chevy’s MyLink infotainment system, navigation system with a seven-inch touch screen, dual-zone automatic climate control, and Bluetooth connectivity. Leather upholstery and heated front seats are also available on higher trim levels. The Malibu Limited performed exceptionally well on crash tests, earning top marks from both the IIHS and the NHTSA. Standard safety features include 10 airbags, all-disc antilock brakes, a six-month subscription to GM’s OnStar service, and an electronic stability system with traction control. Also available are blind spot warnings and rear cross-traffic alerts. 27 of 30 (90%) consumers said they would recommend this vehicle to a friend.